Do you find yourself fumbling around while you drive to change what is playing on your iPod or iPhone? 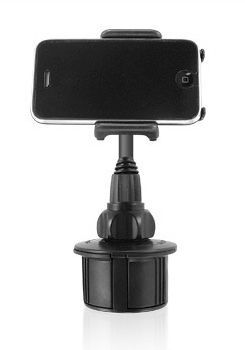 Do you need a holder for your iPhone while using GPS in the car? Are you like me and want a solution for your toddler to be able to watch videos on your iPod in the car? If you answered yes to any of these questions, Macally’s mCup is for you. The mCup is an iPod holder which is compatible with numerous iPods and other devices and it fits in your cup holder. I would estimate it to be about 6-8 inches high when fully extended. You might ask how good does it fit into the cup holder, after all not all cup holders are created equal. Well, it fits great! The mCup has an adjustable base that adjusts to snuggly fit your car holder while turning the dial at the bottom of the unit. The base expands with each turn fitting itself tightly into the cup holder. No need to worry about it going flying on those sharp turns. It even fits great into the cup holder of my son’s car seat! OK, so it fits snug into the cup holder, but what about the iPod? The mCup has two sizes of grips which slide into three positions on the unit. The three positions help you size your grips for your iPod. I tested it with my iPod Touch and a case on the unit. At the largest position the Touch fit very snuggly into the grips and was not going to be moving anywhere. For more customization, the neck of the unit is adjustable and the iPod section turns. Between the two you should be able to find the perfect viewing angle. I only wish they offered a model with a longer neck (maybe a 10 inch model). My only concern lies in the grips and the positioning system While my iPod and case fit nice and tight, other iPod users might have an issue depending on the thickness of your case (if you use one). My case is very thin and I barely got my iPod into the grips. A thicker case might have to be removed, which is a bit of an annoyance. Other than that complaint, the mCup is well worth $19.99. It is well built, and feels like it is going to last a long time. 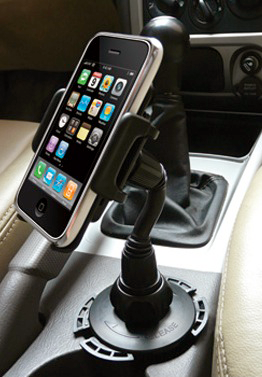 If you are looking for secure iPod holder for your car this is definitely worth checking out. Can an iPhone Replace a Laptop on Vacation?